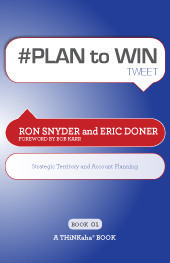 #PLAN to WIN tweet Book01 | THiNKaha: Become a recognized expert in your field of expertise. Compelling thought leadership content. #19 The second best plan finishes second. Sometimes it doesn’t finish at all. #67 Everyone thinks their business is unique. Show them you understand their unique challenges. #123 Without a vision, you’re likely to wander and not make it to the promised land. #125 Ideas are a dime a dozen; putting them to use is priceless. Ask any super salesperson how she or he maximizes results. The response you get is likely to emphasize, either directly or subtly, the value of planning. Successful salespeople are keenly aware that a strategic account plan and a solid territory plan ensure that they make or exceed their numbers. Then why doesn’t every salesperson create exactly such a plan for success? The issue lies not in the what, but the how. How do you create a strategic account or territory plan? Once you have it, how do you implement such a plan? And finally, how do you measure the success of your plan, so that you can either stick with it or modify your course? Regardless of how knowledgeable or experienced you are at selling, a good plan will enhance your ability. It will enable you to make better use of your time and resources to produce winning results. To generate an insightful plan, you need to understand the trends in your industry and geography, focus on high-leverage customers and prospects, collaborate with key partners and always keep a keen eye on what the competition is doing. Building successful sales plans is not easy even in good times. It is particularly hard when the economy is troubled. Now, with the wisdom of #PLAN to WIN tweet at your fingertips in the easy-to-action tweet format, expect to create strategic account and territory plans that win you sales numbers others can only dream about! #PLAN to WIN tweet Book01 is part of the THiNKaha series whose 112-page books contain 140 well-thought-out quotes (tweets/ahas). Ron Snyder, is President of Breakthrough-Inc, a sales and marketing consultancy that enables companies to accelerate sales by aligning strategy and resources, and Plan2Win, SaaS for territory, account and pre-call planning that runs on SalesForce.com. For over twenty years, Ron has helped companies improve results in competitive, high-value, complex selling environments. Ron served Hewlett-Packard as a top performer in sales leadership, marketing and management roles for global cross-functional marketing management and product development. He’s also worked as a product designer and engineering project manager. Ron holds Bachelor’s and Master’s Degrees in Engineering Design from Tufts University and an MBA from Northeastern University. Eric Doner, is the founder of Achievement Training Associates, a consulting firm that helps organizations align and leverage people and processes to improve performance. His career spans over 25 years of success in sales, marketing and training & development. Eric has held positions with Dun & Bradstreet, BASF, Compuware and the American Management Association. He served as President of the Silicon Valley American Marketing Association and published articles and led seminars on Sales Management, Sales Coaching and Customer-Focused Selling. He earned his BSBA at Bowling Green State University and completed postgraduate work in adult learning, human performance development and instructional technology.